under Environment, Green Transportation, Innovation, Poo Power! POO POWER! GENeco, a waste treatment company in Bristol, UK set out to prove that bio-gas could be a reliable alternative transportation fuel, so they imported special equipment to help process their waste and upgraded a VW Bug to run on methane. The poo-powered Bio-Bug is being hailed as a breakthrough, because the bio-gas it runs on doesn’t affect the performance of the vehicle like previous versions of the fuel. The new Bio-Bug only needs 70 homes worth of solid waste in order to drive 10,000 miles a year with a fuel efficiency of 5.3 miles per cubic meters of bio-gas. Modified from a conventional 2 litre VW Beetle convertible, the Bio-Bug can run on both conventional fuel and compressed methane gas. It actually needs a bigtof regular gasoline to start up, then switches to bio-gas when it is warmed up, and can switch back to gasoline if it runs out. Previous attempts to run cars off bio-gas have resulted in a degradation of performance because the fuel wasn’t clean enough, but GENeco claims that they have improved the reliability to the point where performance is not affected at all. GENeco, which is owned by Wessex Water, has a number of facilities around the country processing solid waste. Their facility in Avonmouth has been producing bio-gas which is used to generate electricity for the national grid for many years. About 18 million cubic meters of biogas is produced yearly – and amount which could power 95,400,000 miles of driving per year for a savings of 19,000 tonnes of CO2. 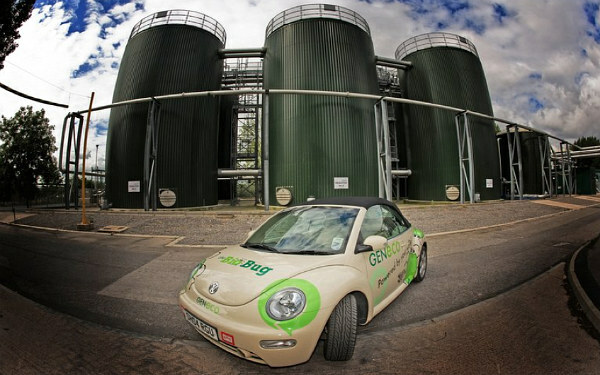 The UK company plans on converting its fleet of vehicles to bio-gas after a trial period with the Bio-Bug. Great ideas, now all we need to do is continue to close the gap between the creation of waste and its beneficial production into energy so that farms and companies that produce waste that can be converted into bio-fuels are self sustaining and providing another energy for society that is efficient and non or low polluting. The better and faster we implement known technologies into our current systems, the faster we will see more positive change. This use of sewer waste is a good way to get something for nothing. The waste treatment plants of all towns should capture the gasses instead of releasing them into the air as is done now.It seems that it might be more efficient to burn the gas to make electricity at the waste plant instead of using the gas for cars. Hopefully this resource will be widely utilized. So surely its a dung beetle?! POO POWER! GENeco, a waste treatment company in Bristol, UK set out to prove that bio-gas could be a reliable alternative transportation fuel, so they imported special equipment to help process their waste and upgraded a VW Bug to run on methane. The poo-powered Bio-Bug is being hailed as a breakthrough, because the bio-gas it runs on doesn't affect the performance of the vehicle like previous versions of the fuel.